A woman obsessed with The Sound of Music predicts the death of her children during wartime. Can foresight change the turn of events? 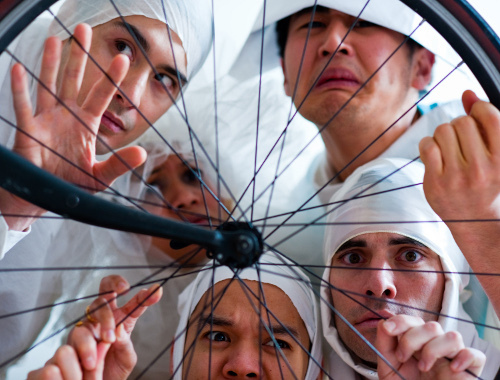 Inspired by Brecht’s Mother Courage and Her Children and using abstractions of musical theatre, Arabic clowning, and Peking opera, A Play on War is a dark comedy set in a war-torn landscape populated by characters on bicycles, all desperate to survive. 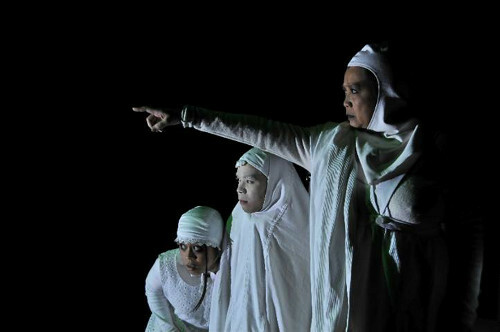 …compelling and arresting; and the on-stage talents-eight Asian American actors, led by the always formidable Mia Katigbak in the Mother Courage role, and two excellent musicians-are doing terrific work. 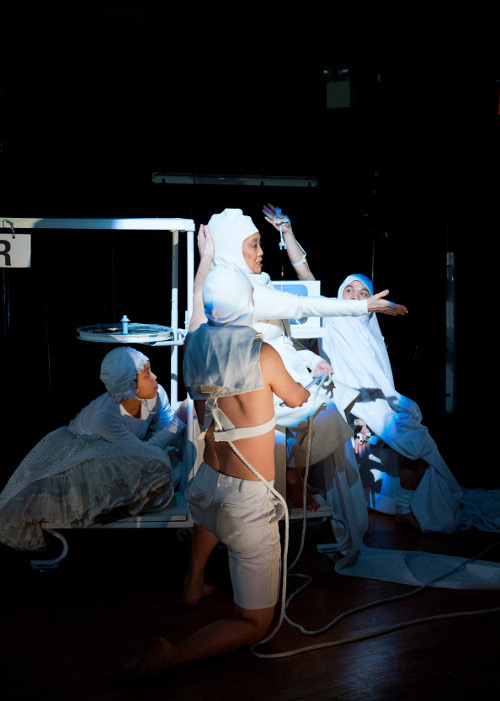 I left with new insights about Brecht’s original and impressed by Mitu/NAATCO’s unwavering commitment to inventive and socially conscious theatre. 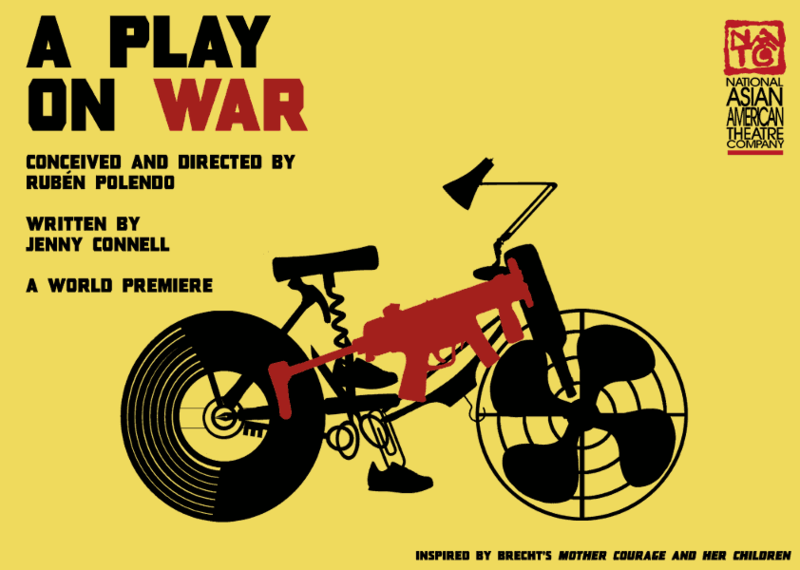 For its invention and intelligence A Play on War is deserving of praise and well worth your time. The excellent talents on display here, and the constant challenges to what we think we know about Brecht’s original piece and about what an anti-war performance might look and feel like, make this show exhilarating and intriguing. …stylistically daring…an intriguing concept, and presents a fresh look at the Mother Courage story. Visually this production is original and intriguing. The white, simplified costumes support the symbolic nature of the characters. The movement is choreographic rather than naturalistic. Aspects of Arabic clowning and the Beijing opera are included, as we’re told. The “bad guys” (of the moment), soldiers who come to grab civilian recruits, ride threateningly fast on child-size bicycles, a particularly effective way of conveying Brecht’s thoughtless, fascist toughs. The music, both as background and as accompaniment, is evocative and warms the experience of watching the play. 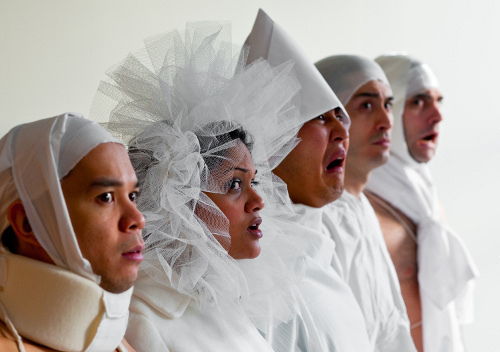 Strong work from a committed ensemble-particularly a heartbreaking Nikki Calonge-boosts us from amused disbelief (are those storm troopers in diapers?) into bewildered admiration and delight. 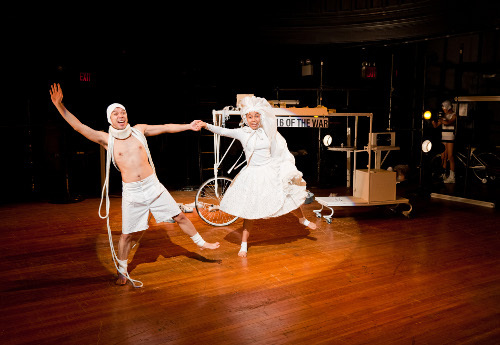 Polendo’s exuberantly bizarre trappings take enormous risks, and the evening could easily have tipped into self-parody. Instead, we feel Brecht’s towering anger at selfishness and violence afresh. Yes, Polendo loves to rack up visual debts; we spot influences ranging from Terry Gilliam’s Brazil to Wall-E. But the people he owes the most is his excellent cast; he asks for the moon, and they shoot it down for him. A beautiful, sensitive and harsh adventure of the highest ambition and intent. A feat of theatrical collaborative fusion like this rarely happens, and I recommend taking part. The acting was as truthful as can be, an even more impressive feat in a deliberate methodology of the fantastic. The show design, across the board, is phenomenal. Simple and theatrical, the perfect balance to the purposefully discordant and at times ridiculously florid music and sound (and I have yet to fully process how delightful I find the Sound of Music motifs, that other and more demure family of war and sacrifice). Well done, designers and associates. Well done, all. This program is made possible, in part, by public funds from the New York City Department of Cultural Affairs, the New York State Council on the Arts, and the National Endowment for the Arts.